It’s no secret that the Marcellus and Utica Shale formations are generating huge economic boons for the states in which they reside. Even as exploration and production increase in both Pennsylvania and Ohio, future projections show that the estimated ultimate recovery (EUR) for the region will outpace recent expansions. A new study by ICF International projects that between the Marcellus and Utica Shale, natural gas production will expand to 34 billion cubic feet (Bcf) per day by 2035. This is a 36% growth from the 2014 estimations of 25 Bcf. Since 2009, the production levels in both the Utica and Marcellus Shale have increased at an exponential rate. These natural gas reserves are vital to the future of American energy independence. These formations, along with the Bakken formation in North Dakota, are driving America’s energy sector forward. As scientists research the full potential of the formations, technological improvements are drastically changing our ability to recover their stored energy. This increased efficiency is a major factor that is driving up the estimated ultimate recovery (EUR) per well. • The Utica Shale is estimated to be nearly twice as large as it’s more famous neighbor, the Marcellus Shale. • Through 2015, Ohio is expected to create over 200,000 jobs and add $22 billion to the economy as a result of the Utica Shale. • The Utica Shale supports 5,000 jobs directly, and almost 13,000 indirectly in the state of Ohio. • The Marcellus Shale contains an estimated 84 trillion cubic feet of natural gas. Some geologists theorize that it could hold up to 500 trillion cubic feet of natural gas, which would make it the second largest field in the world. • The Marcellus natural gas developments contributed $1.1 billion in tax revenue for Pennsylvania in 2010. • Drilling in the Marcellus Formation has only affected .5% of the land mass in Pennsylvania – just 15,400 acres. MATCOR, established in 1975, is one of the most experienced providers of corrosion technology. Our engineering and cathodic protection solutions are best in class. Call 800-523-6692 to contact us today. The Marcellus Shale, an enormous natural gas reserve in Appalachia, is dramatically altering the traditional landscape of America’s natural gas industry. Stretching across almost 100,000 square miles, the Marcellus Shale is the largest natural gas supply in the U.S. and second in the world. The depth and width of the Marcellus Formation vary, but studies indicate the shale’s deepest and thickest points are located in northeastern Pennsylvania, making it a prime area for drilling. Estimates of the amount of recoverable natural gas in the reserve have varied over the years. According to the U.S. Energy Information Administration (EIA), the Marcellus Shale produced 3.9 trillion cubic feet (Tcf) of recoverable natural gas in 2013– accounting for 18% of the country’s natural gas. In August 2011, the U.S. Geological Survey (USGS) estimated the Marcellus shale will ultimately generate a total of 84 TcF of technically recoverable natural gas, a massive jump from its 2002 prediction of two trillion cubic feet. As the Marcellus Shale’s natural gas production increases, so does the need for an efficient, modern, sophisticated pipeline system to transport the natural gas to various regions around the country. In 2012, Marcellus’ booming natural gas output caused pipelines to bottleneck. Such high load conditions inflict stress on pipelines essential to the country’s natural gas delivery system. The following year, pipeline constraints were a major contributing factor to exorbitant natural gas prices in the Northeast region. The rest of the country was not exposed to the increased costs due to adequate pipelines with few constraints. To help alleviate stress on current infrastructures, The Federal Energy Regulatory Commission (FERC) approved three pipeline projects in February 2014. The projects include Texas Eastern’s TEAM 2014 Project, Williams’ Constitution Pipeline, and Iroquois Pipeline’s Wright Interconnect Project. All three projects have in-service dates slated for 2015-2016. Spectra Energy’s Texas Eastern Appalachia to Market Expansion 2014 (TEAM 2014) Project will add approximately 33.6 miles of 36 inch diameter pipeline loop to the existing Texas Eastern Transmission, increasing the existing system’s capacity by approximately 600 million cubic feet per day (MMcf/d). Once complete, the Texas Eastern system will deliver natural gas from Appalachia to the Northeast, Southeast, Midwest and Gulf Coast regions. The technologically advanced TEAM 2014 Project will be optimized for bidirectional flow. The Constitution Pipeline is expected to measure 124 miles and have a diameter of 30 inches. The pipeline will transport natural gas from the Marcellus shale in northern Pennsylvania to areas in the northeastern U.S. It will have the capacity to transport 650 MMcf/d, fulfilling the daily needs of 3 million homes. The Constitution will be an “open access pipeline,” allowing local municipalities and public utility services to access the line. Iroquois’ Wright Interconnect Project (WIP) will work in tandem with the Constitutional Pipeline. Unlike the other projects approved by FERC, WIP is not a pipeline. It will update and expand Iroquois’ current compression facilities located in Wright, New York. 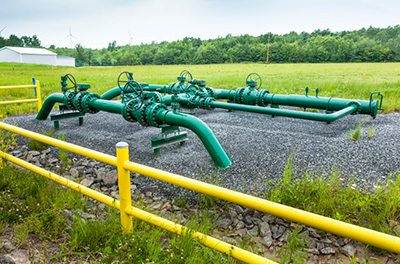 The terminal will connect the Constitution to the Iroquois and Tennessee Gas Pipelines, facilitating the delivery of natural gas extracted from the Marcellus Play to New York and New England. 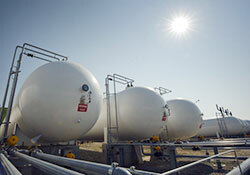 Propane storage tanks at MarkWest Energy Partners’ Houston fractionation and marketing complex in Washington, Pennsylvania. While the Marcellus Formation continues to produce high levels of natural gas, it is imperative that the operators for newly approved pipeline projects, as well as existing pipelines, storage tanks, and associated facilities take appropriate steps to protect their assets. Corrosion of metal surfaces is one of the most common and dangerous threats to midstream infrastructures. Cathodic protection is the most effective method of protecting against corrosion. According to John Rothermel, Vice President of Sales at MATCOR, the leading cathodic protection company with expertise in protecting oil and gas pipelines from corrosion, the companies behind the Marcellus pipeline projects can’t afford not to protect their assets. “There is much discussion about the abundance of natural gas deposits in Marcellus Shale, and there is tremendous focus in extracting this precious resource. However, the industry’s ability to get this product to the end user is impacted by the infrastructure that currently exists. At least one company is looking to take advantage of the rapid growth of natural gas liquids production from two of the largest shale regions in the nation. Sunoco Logistics, a Philadelphia-based company that transports, terminals, and stores crude oil and refined petroleum products, recently announced that it was surveying land for a new pipeline, dubbed Mariner II East, that would connect production of natural gas liquids (NGL) from the Marcellus and Utica shale regions of Pennsylvania, Ohio, and West Virginia to one of the company’s oil and diesel tank farms outside of Mechanicsburg. The company also has plans to convert its existing Mariner East I pipeline, which used to carry oil and diesel fuel west, so that it carries propane and ethane east to its facility in Marcus Hook, which had also been idled. The company bought the refinery from the former Sunoco Co. earlier this year for $60 million and is spending an unspecified amount of money to upgrade it and bring it back online as a natural gas liquids production refinery. Sunoco Logistics is betting on the continued growth of natural gas production, of which NGLs like propane and ethane are byproducts. Natural gas production has increased in recent years thanks to hydraulic fracking, which has resulted in a larger supply that has driven prices down and has therefore, like a circle, created bigger demand for natural gas. As a result of this process, NGL production has climbed during the last four years from 50 million to 70 million barrels per month. But, without greater avenues for NGL transportation, the increased production is moot. Sunoco Logistics says that its plan to build a new NGL transportation pipeline, and convert an old pipeline for NGL transportation, will help create a northeast NGL hub in Marcus Hook that will help meet the demands of NGL producers and local and overseas consumers. The Mariner East projects are only a few of the pipelines being planned by Sunoco Logistics. The company has roughly a dozen oil and gas projects on the books over the next 12 months at a cost of $1.3 billion, four times what it spent on capital expenditures each of the last four years. MATCOR offers cathodic protection safety products and services to companies like Sunoco Logistics, which require cathodic protection equipment to maximize safety, efficiency, and capital investment in their pipeline projects. “Sunoco Logistics Plans Marcellus, Utica Pipeline Through Susquehanna Valley,” The Patriot News, Nov. 21, 2013. The Marcellus Shale Coalition has tabbed one of its founders and past chairmen to be its new president. David Spigelmyer, former vice president of Chesapeake Energy Corp.’s Appalachia division, succeeds Katie Klaber, who had worked as CEO since 2009. Mr. Spigelmyer will oversee a growing coalition, formed in 2008, that works as an advocate for oil and gas developers in the Marcellus region. The Pittsburgh-based organization has grown to include 45 full member companies and more than 200 associate members. “I am deeply honored to have this organization’s trust instilled in me and grateful for the talented team of professionals that we have in place at the MSC,” Mr. Spigelmyer said in a press release. At Chesapeake, Mr. Spigelmyer oversaw government relations, regulatory policy and communications, among other responsibilities. His position there was one of several eliminated this summer in a massive corporate reorganization plan. Before working for Chesapeake, he had similar roles at EQT Corporation and Dominion Resources. He was chairman of the Marcellus Shale Coalition until this August, after he left Chesapeake. He previously served as the coalition’s vice chairman and as lead of its legislative committee. Mr. Spigelmyer is a Penn State University graduate. MATCOR is a proud member of the Marcellus Shale Coalition. Steps have been completed as work proceeds on the Transco pipeline expansion project in Franklin and Union townships in Hunterdon County. In this area Williams Co. has completed pre-construction surveys, cleared and graded land, trenched — moving topsoil to separate mounds in agricultural areas — strung pipe near the trench. According to the company, once pipe sections are welded together they are “placed on temporary supports along the edge of the trench. All welds are then visually and radiographically inspected. Line pipe, normally mill-coated or yard-coated prior to stringing, requires a coating at the welded joints. Prior to the final inspection, the entire pipeline coating is electronically inspected to locate and repair any coating faults or voids” before the pipe is placed in the trench and backfilling begins. That is followed by testing the pipeline and restoration of the work area. HARRISBURG – Gov. Tom Corbett has announced that the Marcellus Shale Impact Fee, part of Act 13, signed into law in February of 2012, has brought in more than $400 million dollars in its first two years. “As this industry grows, benefitting all Pennsylvanians with thousands of new jobs, lower energy prices, and increased energy independence, Act 13 has played a key part in our role making sure that it grows safely and responsibly,” Corbett said. Collections for 2012 were due to the Pennsylvania Public Utility Commission (PUC) by April 1. Nearly $198 million is expected to come into the state from the 2012 collections. This is in addition to the $204 million collected during the first round of collections. The 2012 amounts were released yesterday. The collections this year are slightly lower than last year due mainly to the lower price of natural gas. Information on the amount of money expected for 2012, as well as the amount of money collected to date, can be found on the Act 13 page on the PUC’s website, www.puc.pa.gov. Bluegrass Natural Gas Pipeline – Moving Forward! Oklahoma’s Williams (NYSE: WMB) and Houston’s Boardwalk Pipeline Partners (NYSE: BWP) have teamed up to develop a new major natural gas pipeline, named the Bluegrass Pipeline, which would cut through Kentucky and connect gas fields underneath Pennsylvania to refineries and export markets on the Gulf Coast. That means resources from the Marcellus Shale will now be accessible by facilities in Texas and Louisiana, which can then export them around the world. Kentucky.com reports that the pipeline, once completed, would allow for the initial transport of some 200,000 barrels of natural gas liquids per day from the shale operations in Pennsylvania, Ohio, and West Virginia over to the facilities along the Coast. This capacity would later be upgraded to 400,000 barrels per day, chiefly by the addition of liquids-pumping capacity. The venture also means wholly new facilities, both along the pipeline’s route and in the South where it terminates, would be constructed and developed, the Pittsburgh Post-Gazette reports. Roughly 40 percent of the project proposal comprises new construction and development, and this is focused largely within the Marcellus region, though no exact locations have yet been decided upon. An interconnect in Kentucky would connect to origin points of the pipeline located in Ohio and West Virginia. Also in Kentucky, an existing system will partially be reconfigured to allow for the transportation of natural-gas liquids, Kentucky.com reports. The final route the pipeline will follow has not been determined yet. This project comes as the latest in a series of high-profile pipeline development efforts in and near the Marcellus Shale region, as companies try to exploit the lacking American pipeline infrastructure situation by building new networks that can handle the rush of shale-derived oil and natural gas (and related products), which the existing heavy crude pipelines cannot readily do. In fact, the situation is so complex that some Marcellus and Utica shale producers have had to slow down their operations as they wait for the pipeline network infrastructure to play catch-up. But natural gas prices have dropped even further, so developers are showing more interest in liquids derived from natural gas, like condensate, ethane, and other natural-gas liquids, Kentucky.com reports, which could be sold in numerous markets both domestic and international. According to Williams, the present system is likely to be under too much pressure as soon as 2016, with the total volume of natural-gas liquids being produced in the Northeast projected to go over 1.2 million barrels per day by 2020. The way Boardwalk and Williams envision this project is for the pipeline to deliver mixed natural-gas liquids from the shale zones in Ohio, W. Virginia, and Pennsylvania to numerous fractionation plants and storage centers. These have yet to be built, but they will be positioned along the pipeline’s route. They would subsequently link up with petrochem plants and end-product pipelines along the Texas and Louisiana coasts. No costs have been cited yet, as those are part of the details still being worked out. The problem of moving the shale derivatives out of the Northeast and nearer to the refineries and other facilities is one of the U.S. shale sector’s biggest issues, and this project will undoubtedly do its part in alleviating the pressure. Roughly 60 percent of existing pipeline can be used, according to Kentucky.com; this is mostly owned by Boardwalk, named the Texas Gas Pipeline. New construction would simply expand on this network. It would allow the project to possibly come online by or in the second half of 2015, while also keeping construction costs down. Boardwalk has nearly 1,420 miles of natural gas pipeline networking through Western Kentucky and employs 315 out of its 1,200 employees within that state. Prior to this development, Enterprise Products Partners LLP and Chesapeake Energy (NYSE: CHK) came up with a similar plan in 2011 to develop a pipeline that would transport ethane from the Marcellus Shale region, connecting it to refineries and facilities along the Gulf Coast. More such projects will need to be developed before the Appalachian shale bottleneck can see some real relief. $44 million project would put 5.6-mile line through Bucks County, PA.
One of MATCOR’s key clients Texas Eastern Transmission LP, is seeking federal approval of a $5.3-million expansion of its pipeline and compressor station system to distribute Marcellus shale gas produced locally by Chevron and EQT. A subsidiary of Spectra Energy Transmission, of Houston, Texas, Texas Eastern wants to gain Federal Energy Regulatory Commission (FERC) approval in November this year and put the new pipelines into service by November 2014, according to a pre-application filing recently submitted to FERC. The project involves installing a total of 33.6 miles of new pipeline in five counties in the state; upgrading four compressor stations in the state and other work at 41 company facilities between Pennsylvania and Mississippi. MATCOR has the ability to provide its SPL Mixed Metal Oxide Linear Anode to cathodically protect this pipeline expansion. “Texas Eastern’s (pipeline) runs from the Gulf of Mexico to Lambertville, N.J. This is an expansion of that system,” said Spectra spokeswoman Marylee Hanley. Texas Eastern has agreements with Chevron and EQT to charge them for the work, which would provide both producers with the capacity to transport 300,000 additional Btu/d. These two shippers are major producers in the Marcellus shale play need the project to ensure that pipeline capacity exists to transport their gas to markets as the production comes on line. The shippers have agreed to pay negotiated rates for the pipeline service, according to Texas Eastern’s FERC filing. “We are an open access pipeline, which means we are required to provide service to our customers,” Hanley said. The new pipelines would be installed adjacent to existing pipelines in existing rights of way, and all the compressor station work would be done on the stations’ existing property, she said. Specifically, the project would transport 300,000 Btu/d of gas from western Pennsylvania to the eastern end of the system in Lambertville, N.J., and Staten Island, N.Y.; 50,000 Btu/d from western Pennsylvania to the Lebanon, Ohio, hub and 250,000 Btu/d of of gas from western Pennsylvania to markets in Mississippi and Louisiana. In recent headlines from the Marcellus Shale natural gas boom, a major interstate pipeline company wants to expand its transmission network in the Philadelphia area to deliver more gas to customers. Columbia Gas Transmission Group (A MATCOR client) submitted plans Monday with the Federal Energy Regulatory Commission (FERC) outlining a public campaign for its $210 million project. The East Side Expansion Project, so named because it adds capacity to the eastern part of Columbia’s 16-state system, includes installing a 20-inch-diameter pipeline on a 7.5-mile route in Gloucester County and a 26-inch-diameter pipeline for 8.9 miles in Chester County. “We are responding to a demand for increasing capacity of natural gas from our customers,” said Brendan C. Neal, community relations and stakeholder outreach manager for the transmission company, a subsidiary of NiSource Inc. The new and larger pipes with greater capacity, which would be buried alongside existing Columbia pipelines, will require the company to acquire additional right-of-way from adjoining property owners. But the project is less likely to create public apprehension than a pipeline crossing virgin countryside. “Since they’re running along an existing line, it does limit some of the concerns,” said Lyman Barnes, administrator of Logan Township, Gloucester County. The work would expand capacity on a part of Columbia’s pipeline that runs from New York state to Virginia through Southeastern Pennsylvania. The existing line connects to the Millenium Pipeline near Port Jervis, N.Y., and transports Marcellus gas southward to Downingtown, where an eastward extension goes under the Delaware River into South Jersey. The new line would expand supply options for the West Deptford Energy Station, a 738-megawatt gas-fired power plant being built in Gloucester County by LS Power Group. That plant, scheduled to go into service next year, would consume up to 80 million cubic feet of gas a day. Columbia will increase capacity on its existing pipeline mostly by adding more horsepower to compressor stations in Milford and Easton, Pa., which will push greater volumes of gas though the pipes. Those station expansions are likely to attract the attention of environmental activists, who have objected to air emissions from other such projects. Pipeline infrastructure designed to deliver natural gas from traditional production areas in the Gulf Coast states is being reconfigured to accommodate new Appalachian shale production. The project would require FERC approval. The papers filed on Monday with the federal agency were a request to initiate a “prefiling,” which would include public meetings in April before the company formally files its application with the commission in August. Columbia anticipates FERC would authorize construction by June 2014. A $750 million plant in Lawrence County, powered by Marcellus shale gas, could begin generating electicity by 2016, officials said. LS Power Development LLC received North Beaver supervisors’ approval this week to build a 900-megawatt plant along the Mahoning River at the site of a former American Cyanamid Co. explosives manufacturing plant. Construction could begin early next year. The New Jersey-based company needs state and federal permits, and the state Department of Environmental Protection is reviewing several requests, project manager Casey Carroll said on Wednesday. “We’re trying to respond to the large number of proposed retirements — some 3,000 megawatts” of power generation capacity in northwest Pennsylvania and northeast Ohio, he said, addressing how the company chose the location. One megawatt can power about 800 homes. The proposed Hickory Run Energy Station also needs access to high-voltage lines, interstate natural gas pipelines and a water supply source. LS Power’s project is moving forward as electric generation companies are closing less efficient coal-fired plants or converting them to run on cheaper natural gas before tougher federal air pollution standards take effect in 2015. FirstEnergy Corp. of Akron, American Electric Power of Columbus and GenOn Energy Inc., which NRG Energy of Princeton, N.J., acquired for $1.7 billion in December, along with other operators announced closings of dozens of plants last year. Natural gas plants account for 95 percent of generation planned in grid operator PJM Interconnection LLC’s territory covering 13 states and the District of Columbia, spokeswoman Paula DuPont-Kidd said. Wind used to be the fastest-growing sector, she said. Pending deactivations of coal-fired plants add up to more than 16,000 megawatts of generating capacity, PJM documents show. Carroll said LS Power, with offices in East Brunswick, N.J., and St. Louis, has a contract to buy the Hickory Run site off Route 551, about 45 miles northwest of Pittsburgh. Tennessee Gas Pipeline Co. owns and operates the gas lines that would supply the plant, and has a system that runs from the Gulf Coast to the Northeast. Carroll said 500 workers would be needed to build the plant, with an estimated payroll of $100 million. The completed power station will employ 25. LS Power owns or is developing power plants that run on natural gas, coal or renewables such as wind and solar, and is building high-voltage transmission lines, its website said. In Pennsylvania, the company has a natural gas-fired plant under development in Berks County.